Stay tuned for upcoming events for Pakistan Culinary Festival in near future. All Free - Kids Gaming Zone, Musical Evening, Gifts, Restaurant Vouchers, Seminars, Puppet Show, Face Paintings & many more! Confirm your booking & enjoy this colorful family festival starting from from 1st Dec, 2016 to 04, Dec 2016. Entry Fee is Rs/= 200 for All & Rs/= 100 for Kids & Senior Citizens. Grab your passes for the biggest event 'Pakistan Culinary Festival 2016' from any of the following locations! 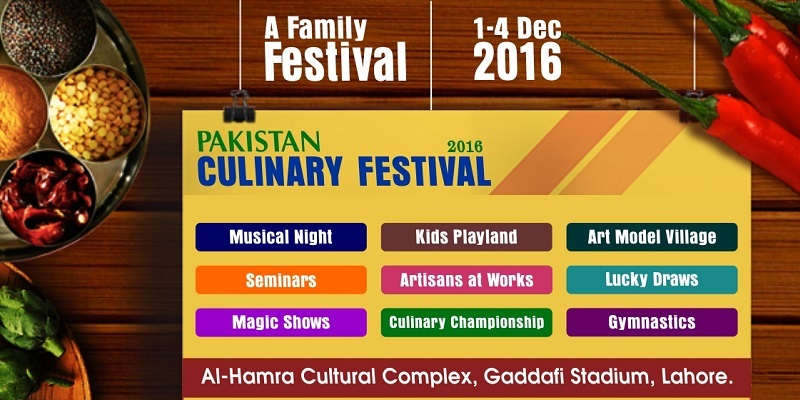 Pakistan Culinary Festival hosts restaurants stalls, food and beverage companies stalls, children's play-land, conferences and seminars regarding culinary, hospitality and tourism trends, artisan work display, musical evening, and lucky draws, gymnastics, magic shows and much more. 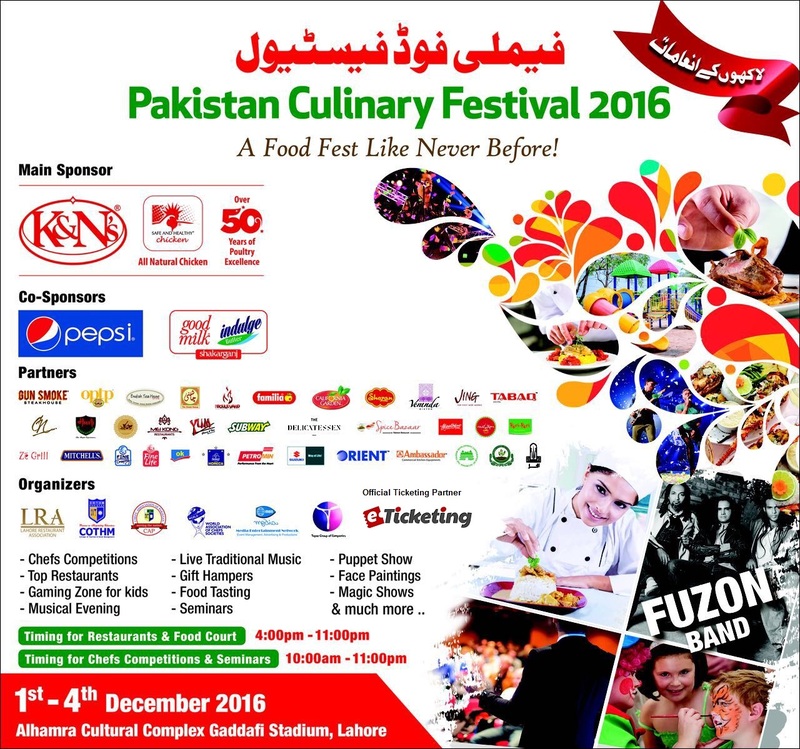 Pakistan Culinary Festival 2016 will run from 1 to 4 December 2016 at Alhamra Cultural Complex near Gaddafi Stadium in Lahore. Pakistan Culinary Championship 2016, the first culinary competition in Pakistan, for professional chefs, will also be part of the Pakistan Culinary Festival 2016. Pakistan – Land of the Pure – is rich in heritage, diversity, weathers, landscapes; an amalgamation of the richest flavours of life. Time and again, Pakistan’s distinct beauty is celebrated, highlighting its true place among the eminent nations of the world. Culinary aspects of Pakistan bear no meager repute. Abundant cultures and cuisines exist, from the snow-capped mountains of the North, to the lush green fields of East, beaches and fresh sea produce of the South, and vast desert and stretches of the West, filled with the untapped wealth of potential. "A Taste of Pakistan" is the brainchild of similar thought – that the beauty of this nation, its heritage and infinite colours, choicest flavours and unlimited potential, be depicted in a manner traditional and true to Pakistan. Culinary means "related to cooking". Culinary arts are the art of the preparation, cooking and presentation of food, usually in the form of meals. People working in this field are commonly called "chefs" or "cooks". At its most general, the terms "culinary artist" and "culinarian" are also used. Terms & Conditions : Organizer reserved entry rights .No refund possible. Only time entry allowed. Best Viewed at 1024 x 768 pixels and above. This Page loaded in 0.07084 seconds on Tue, Apr 23, 2019 (21:48).